Water as a symbol can be found in cultural and historical aspects in the cities of Gjirokastra and Berat. Geographically, both have a river, Drino & Osum, running below cities that are largely set on the side of mountains. Artistically represented as source of life in “The life-giving spring”, an early 19th century icon from the church of Illia in the “Përrua” quarter of Berat, dated 1812-1814, around the same time that Ali Pasha Tepelene had a 12 km aqueduct built from the Sopoti mountains, increasing Gjirokastra’ s drinking water supply to 28,000 gallons a day. There is also a legend of Berat in which the mountains Tomor and Shpirag fought over a woman, who’s tears made the Osumi River. Water is deeply entrenched not only with the history, but to the survival and also the development and identity of the two cities. Today, thanks to the geographical position of Berat and Gjirokastra, one can look over the city from the castles and easily view a modern evolution that has been incorporated into the landscape – the roof top water tanks and satellite dishes. In what other ways do these private receptors of water affect the way we live our lives? 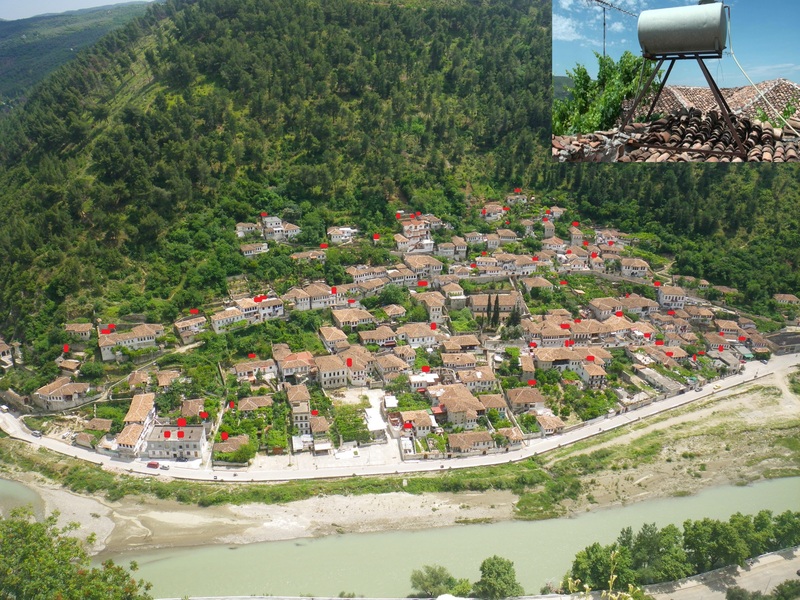 On June 1, 2012 Prof. Dr. Sotir Sotiri of Seismiology wrote an article about the danger of earthquakes or any ground tremblings in Albania and the safety issues with the roof top water tanks throughout the country. 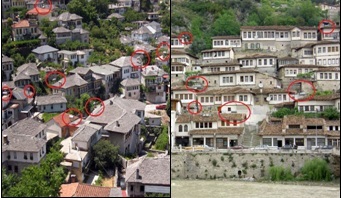 In 2011, a workshop and report was prepared for UNESCO on Disaster Risk Preparedness and Management in Berat and Gjirokastra, which outlined other risks from fires, landslides, falling rocks and also earthquakes – any of which could potentially destabilize a roof top water deposit. Since 1991, local municipalities have struggled to manage the water supply and distribution due to deterioration of and illegal interference with the pipes, lack of funds, unqualified staff, corruption and many other reasons they believe will be fixed very soon. Being realistic, regular water (and power) supply still seems as a long term goal, and private elevated water deposits have until now been the main solution. The efficiency of elevating water tanks is in storing gravity-fed water for later use. If the water deposit is located at ground level, a pump is needed and uses additional power, which is still not consistently guaranteed 24/7. The view of countless individual water tanks is very clear from the current landscape of the roofs of Berat and Gjirokastra. An apartment in Gjirokastra has 15 separate tanks lined up on the top 2 floors of the building – an individual owner’s choice as solution to the lack of water supply, which started after 1991. Not only these two cities, but all cities in the country have the same landscape. Estimates from the IPA National Programme 2010 for Albania give two interesting figures: 1) Only 78% of the population is connected to water (56% rural, 88% urban); 2) 60% of water resources are “unaccounted for“. In 1670, the Ottoman traveller Evliya Chelebi visited Berat and Gjirokastra praising the quality and availability of water resources in both cities, and stated that inhabitants had private water cisterns, public cisterns and fountains. More recent texts such as the 2011 UNESCO report on Disaster Risk Preparedness and Management and other architectural reports outline that many traditional Ottoman houses in these cities do in fact have internal cisterns, however they are generally not in use. He also warned that of five public fountains in Gjirokaster “the water supply is not sufficient for the whole town.” Evidently this was understood in the efforts of Ali Pasha to have the aqueduct constructed in 1811 (destroyed in 1932 as part of King Zogs plans to turn the castle into a new prison construction). Chelebi brought attention to Albania’s water resources over 340 years ago, and that interest continued. The Chinese were actively engaged in building water infrastructure in Albania from the 1950s to 70s. The World Bank has been an active player for many years, and since 1988 Germany alone has contributed 271 million euros to the water and sewerage sector in Albania, including 71.7 million euros in financing and loan agreements from Switzerland, EU and Germany, announced in March 2012. Also under way is a 26 million euro investment by the EU plus an additional 20 million euro loan from the German government for servicing fresh and waste water to Velipoje, Lushnje, Berat, Fier, Saranda and Elbasan. This is far from the complete list of water-related investments. It is indeed significant that in these cities with historically elaborate and praised water supplies, in a country with among the most fresh water resources in Europe, plus the addition of over 300 million euros in the last 24 years to the water systems, and still the water tanks reign supreme. As mentioned before, any ground movements such as earthquakes, or as fires, falling rocks or landslides, as suggested to UNESCO, would cause serious additional damage and injuries to inhabitants whose water tanks are on roof tops, and a potential danger to bystanders and neighbours. 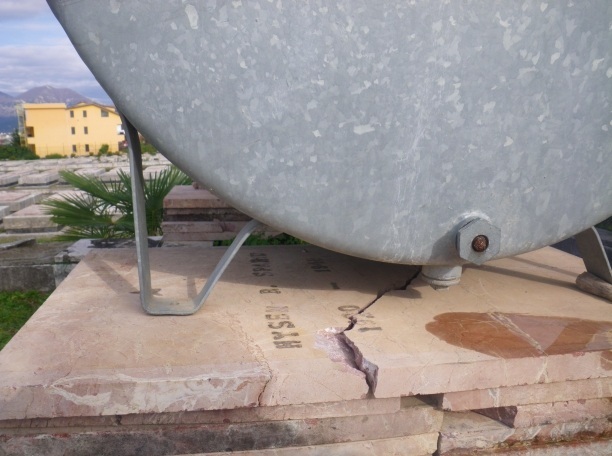 A full 250 litre water tank weighs close to 270kg, and one can easily imagine the damage that could be done by a falling tank. Are there zoning laws that address the use of water deposits? Checks for proper installation? What do insurance companies say? Another concern with water deposits is water quality. How often are they cleaned and are filters or chemicals used? What is the municipal by-law on deposits? Do they offer services and information related to storing water safely? Do they have any responsibility over private water deposits? New York City in 2009 imposed a local law requiring building owners to inspect drinking water tanks at least once a year and keep the results on file for at least five years, with inspection records given to the Department of Health and Mental Hygiene. The law also created civil liability for non-compliance. The reason they said was to be sure the structural integrity of the tank is intact, and there are no openings for birds, rodents or other contaminants including sediment, algae and salmonella. Buildings unable to produce proof of inspection may be fined between $200 and $2,000 per violation. What about Albanian water tanks? Do we just ignore health and safety, because `this is Albania`? 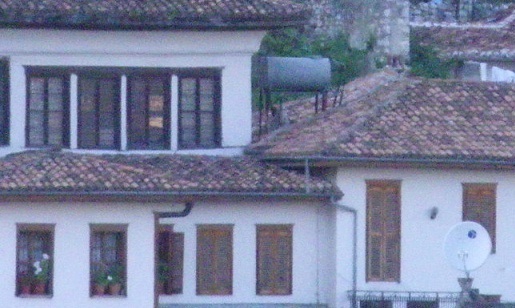 In 2005, Gjirokastra and in 2008 Berat, were inscribed by UNESCO as “…as rare examples of an architectural character typical of the Ottoman period”. It is interesting to note that the original architecture that has made these cities famous, did in many cases and still does have water storage cisterns on the lower levels, yet the roof top deposit has triumphed in the late 20th century and well into the 21st century, despite being placed directly on top of what has been recognized as outstanding world heritage. It is easy at first to ignore the sight of the deposits, however once they have been noticed, it is just as easy to ignore the architecture below and behind them. Substituting turbines for tanks, one does not feel a narrative has been established in these cities, as the balance is lost between the highly valued 18th century heritage and the haphazard display of 21st century Albanian survival and reality. Surely there are creative ways to re-establish the balance in these cities while combining the elements of life and modern living. At some UKT water company offices in Tirana, corroded old hydro materials are presented as sculptures and there are small photos on the walls, of equipment we generally ignore. This indicates that there is some level of heritage and art being created and preserved in this sector, and an effort is being made to interact creatively with customers and workers. Pieces may be an old pump or pipe, and are shyly displayed as a ‘museum object’ of value. 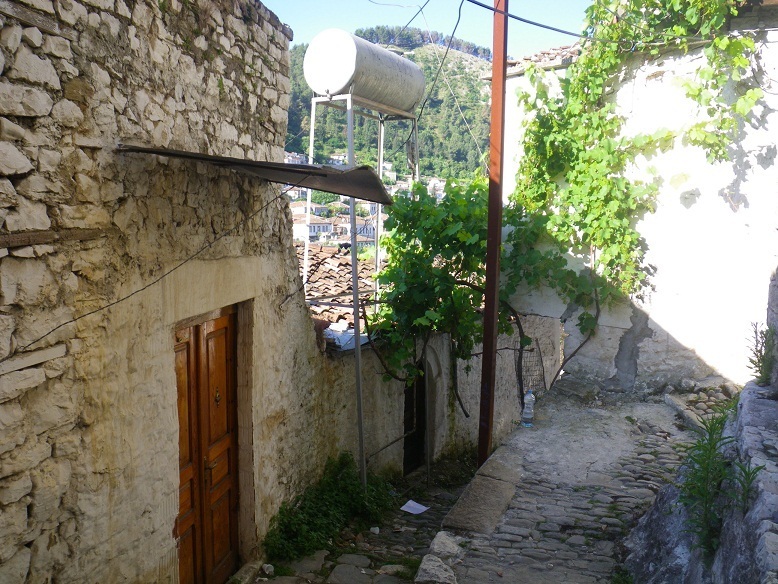 The priceless ‘museum cities’ of Berat and Gjirokastra, however, are blooming with water tanks that offer no additional value other than having running water when there is no power. 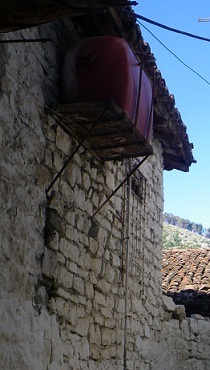 The local inhabitants’ priority is saving water for when there is no power, and although it might be possible that displaying a water tank is a status symbol or is seen as beautiful by the citizens, it is more likely that no thought or care for aesthetics, balance, or a narrative were even considered. The legacy of these cities, if we remove titles like “Museum City” and status like “Outstanding World Heritage”, and see the cities for what is really visible, we find that the defining feature IS the water tanks. Will they one day be in a museum too, or have they already secured their place as a part of the “Museum Cities” of Albania? d) Water as heritage, or future UNESCO heritage? While water tanks might be impressive to someone, they are the daily bread of inhabitants who have gradually become accustomed to setting water deposits and watching them grow one by one. While we continue the discussion on water as heritage, it should be kept in mind that for the newest generation in these cities, roof-top water deposits are a fact of life, and are the de-facto life-giver. If we have already used these water tanks for 20 years, for how many more years will these objects be part of our water culture? When does it reach the point where water tanks should be protected as heritage? Water deposit elevated on a cracked tomb. In 2012, we still see water deposits more prevalent than ever. We are in the midst of the 2008-2013 phase VII of UNESCO`s International Hydrological Programme (IHP) devoted to water research, water resources management, and education and capacity building. Meanwhile, UNESCO is also undertaking a project to train institutions involved in the governance of Albanian water resources. Does this programme discuss water deposits? And is there a relationship between designating Berat, water tanks and all, as a UNESCO World Heritage Site, and the UN Millennium Development Goals (MDGs) 2008-2012 on water supply? Relief sculpture commemorating the Bogove Aqueduct to Berat in 1988. Berat centre, in front of a fountain that doesn’t work in 2012. Despite all the projects, programmes, workers, investments and loans, the continued use of the deposits is not disappearing, and we now have to consider answering the question – Should roof-top water deposits be classified as national symbol of Albanian cultural heritage? And if we are to look at them every day, ever where in the country, shouldn’t we do something about it?